Local individuals and groups make a significant contribution to making Farnham an attractive, interesting and welcoming place to live. However, the impact of all this voluntary work is greatly enhanced if it is done in concert with the local authorities which have responsibilities for delivering essential services to the community. BCG has been very pleased ever since its inception to participate in this way and has helped to achieve outstanding results in a spirit of partnership. 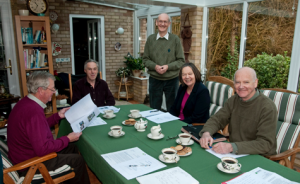 The photograph of an informal meeting with local councillors in 2012 to discuss the way ahead makes this point. Since that time budgetary and staff cuts have resulted in ever greater dependence on volunteer effort across the board. BCG continues to respond to the limit of its capacity as demonstrated by the work in 2017 on building steps on the public footpath through Sable Wood in conjunction with the landowner. BCG has enjoyed a good working relationship with SCC, sometimes working through the County Councillor for South Farnham, sometimes direct to the officers. 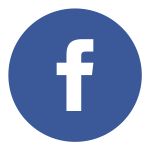 The first contacts were with the Rights of Way department because of our interest in improving the state of the footpaths and bridleways in The Bourne, work that has continued ever since – see the Footpath Maintenance page. The picture shows the then BCG treasurer levelling up a marker post with the County Footpath Assistant looking on. 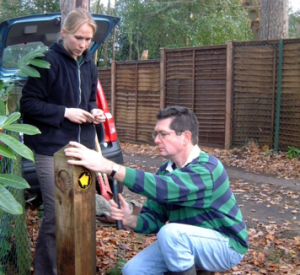 A chance contact with the County Landscaping Officer in 2005 led to an invitation to our Group to participate in a trial to explore the feasibility of introducing voluntary Wildlife Wardens into every parish. After much deliberation we decided to take part and, although the scheme in that form did not get off the ground, it was a rewarding exercise for us. The Landscaping Officer was then most helpful in getting us up and running on our first independent conservation project at The Bourne Crossroads. Ten years later, working with the Highways Department BCG took a leading part in the very successful Bourne Beautification Project which led to the building of the new raised flower bed at the Crossroads and installation of the Lower Bourne village signs. The inaugural meeting of BCG in The Bourne Hall was conducted jointly by Dr Stan Cockett and Ron Hills, the Waverley countryside ranger for The Bourne at that time. This led to a fruitful partnership with the Borough Council which has benefited both sides. We learned a number of skills from a series of their rangers, especially in the area of woodland management, and we have provided enthusiasm and growing expertise in helping to manage the main local green spaces in The Bourne. Over the years joint work has taken place in Paradise Wood, Compton Copse, both Burnt Hill Woods and, in recent years, in Langham’s Recreation Ground. We also planted trees on The Bourne Green and in 2017 started a joint project there to carry out further planting as well as improving the seating and litter bins. WBC is also the Local Planning Authority and for a long period BCG scrutinised applications for new developments and made informed comments, normally as objections on environmental grounds. Although not exactly an example of working in partnership, BCG is designated as an Alternative Consultant on local conservation issues. In 2007 a close relationship with FTC commenced when BCG, working with neighbouring residents, started to tidy up the community garden in Middle Bourne Lane. This led to acceptance of a submission by us of a plan to manage the site and to convert it into a community wildlife garden including the construction of a pond. 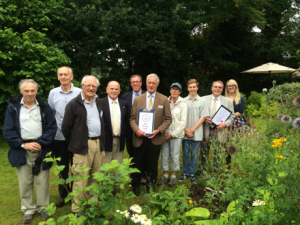 With the success of that project at no public expense it was natural that, when Farnham first entered the Large Town Category of the In-Bloom competition in 2011, the Middle Bourne Lane garden should be included on the judges’ itinerary. The picture shows our team with Council officials and judges in 2016. This has been repeated every year since then and extended also to include The Bourne Crossroads. We also used our local knowledge and conservation expertise to contribute to the wider participation in drawing up the Farnham Neighbourhood Plan which was approved by referendum in 2017.